This package creates a 12' x 20' canopy that sets up quickly and usually doesn't require a building permit. The structure is made from beam welded 2" 17-gauge steel tubing that is tough enough to handle all but the most rigorous weather conditions. The frame is prepared with the Rhino Shield preparation and finished with a baked on powder coating that eliminates rust, weathering, peeling, or chipping. The frame members assemble using slip fit connectors and swedged tubing. 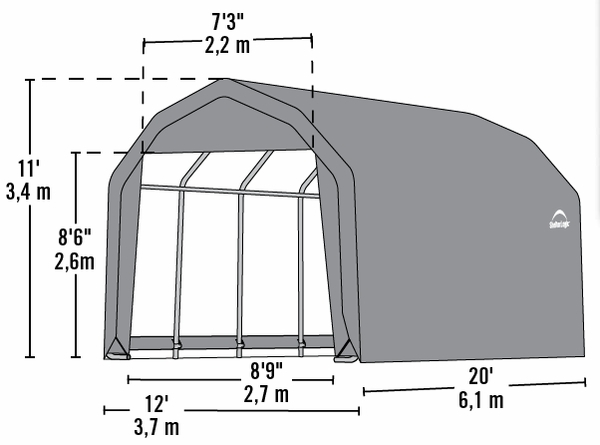 The shelter has six ribs, and each of the legs has a wide based foot pad that creates stability and provides access to secure anchor points. The one piece cover is made of heat bonded, triple layer polyethylene that is 100% waterproof and resistant to fading, aging, and fungus. It has a white interior lining that enhances the natural illumination. 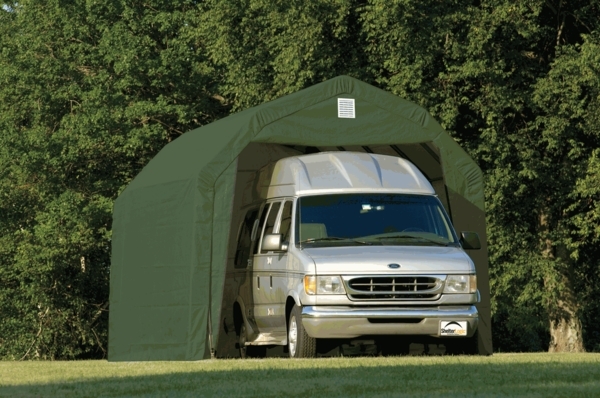 The package includes the frame, cover, door panels, anchors, and complete instructions. What is the open door height and width when the unit is fully open? The door width is 8' 9"" and the door height is 8' 6". Does the warranty cover natural disasters, such as hurricanes? No, it does not cover any weather-related issues and covers manufacturing defects only. I like the garage and it was easy to set up. This canopy was just as described.